Let’s kick off December in style, just like everyone else: with holiday shopping! Dive in to a gift guide that features a bunch of stuff I like (which everyone else will undoubtedly love as well), replete with everything from bargains to basics to badass splurge-presents. Got someone special in your life? Does she seem to have an identical personality to me? Are you one of my immediate family members looking here to see what I want for Christmas? You’re in luck. 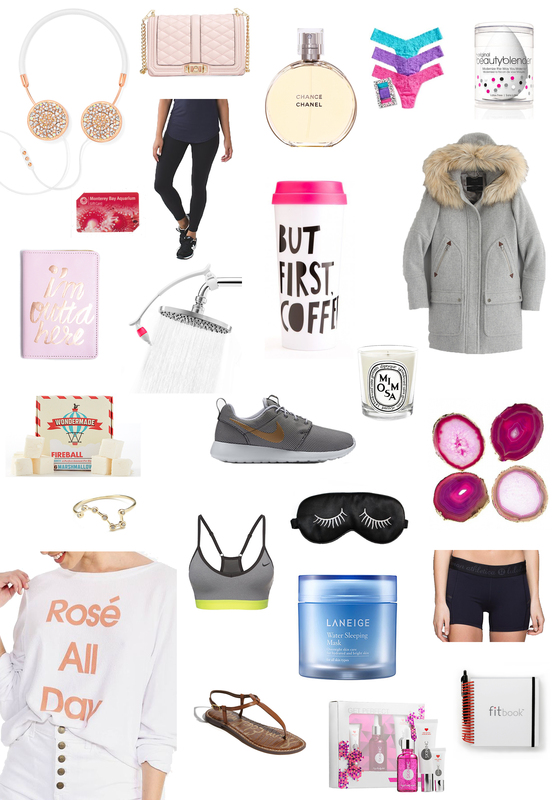 I’ve compiled my holiday gift guide from across the interwebosphere just in time for holiday shopping, which we all know is just my personal procrastination from real responsibility. I would like to give this piece some context. I was at a club recently (which literally never happens) and I asked the bartender if I could ask “an embarrassing question.” Long story short, my question was “do you have fireball” and he found my self-shame to be so hilarious, that he gave me my $20 drink for free. But like think about it for a second cinnamon whiskey marshmallows!!! I love baby sea otters more than most things in life. Also experiences > things. I have the high times in luxtreme in a white color and i’m obseeeeessssssed with them. I need them in plain black. NEED. Because why wouldn’t I want a luxurious and aromatic spa-like experience. If any brand could capture my personality, it’s probably this one; I’m obsessed with everything they make. I recently received (read: was totally spoiled with) an array of gems – a passport cover, rose gold pouch, coffee tumbler, pens, notebook, and battery pack… and they’re all flawless. Not to mention, all the goodies came in the cutest package, filled with glitter and confetti and pixie sticks and disco balls. So, although these items are no longer on my particular list (thanks ban.do! ), anyone with the same taste as yours truly would die of happiness upon receipt of anything from this ban.do. I’ve been wearing this perfume since I was 14 years old… and I’m out (hi dad!). These grey & gold Roshe Ones are what dreams are made of. Also high on the list: Fleece Juvenates and Air Max Thea. My favorite handbags (within a reasonable price range) are all RM. I love the Love Crossbody (that one is a cool color/special edition), also in red velvet because the plum/gold one of my dreams sold out. I’m also obsessed with the Micro Moto bag, and love the Micro Avery. The Mini MAC has been a staple of mine for years! I’m basic, you’re basic, and these are beautiful. This is a killer price based on the competition (Calypso St. Barth & Jonathan Adler). I am due for a replacement of these; I’ve had rose gold ones for a while and I’ve worn them into the ground. These are classic and go with everything, from dressy to casual. I absolutely love this bra… it’s comfortable, supportive, and shaping. I’ve worn it for anything from hot yoga to a half marathon, and it’s been amazing. The one I linked to in the title is a beautiful (but pricey) special edition. This one and these ones are on sale. I want ALL OF THEM. My favorite running shorts! They’re slimming (hello, compression) and they don’t ride up while you run, which is the most crucial factor with running shorts. They’re amazing for any other sport outside of running, too. Such a good staple that would make an amazing gift for the fitness fanatic in your life. I’ve talked about these before in my half marathon guide… these are phenomenal and as far as I’ve seen, unparalleled for fitness. Underwear makes a surprisingly awesome gift, and I for one get very excited about it. Which leads me to…. The best of the best. They’re never on sale, but the link goes to Macys.com and they’re definitely 25% off right now! If the Dominique-clone in your life is looking to set a goal in 2016, this will help her get there. It’s a detailed 12-week program, tailored to your goal, with fitness and nutrition logs incorporated into your goal setting. As the original of the clone, I can say that I’m desperately searching for the next half marathon to sign up for so I can get my training and goal tracking in motion. Anything from Voluspa, Votivo, Jo Malone, Archipelago, NEST or Diptyque will win Christmas. I’ve wanted a J.Crew coat for years, but they’re particularly pricey. The Chateau Parka and Cocoon Coat have been on my wishlist for at least 365 days. Candy-colored coats are my calling. Unfortunately it seems like all the petite colors are sold out, FML. Please anyone reading this, do you know where to get this ring? I know that’s my job, but I’m not perfect cut me some slack I’m a human being. I can’t find this ring, I need it, you need it, everyone needs it, please help. The beauty sponge of everyone’s dreams. This one is on sale for a decent price at amazon. There are few things as lushury as a sleep mask. This one is cute and inexpensive. This one looks amazing and comes with ear plugs. Speaking of masks, I really want this night-time water mask, and so does everyone else on your holiday list. Like a spa day in a box. This was gifted to me recently and I can’t tell you how glam this set is. It’s got a peel, serum and a mask. Amaze. A Wildfox Sweater is a staple and instant-hit as far as gifting goes. There is nothing quite as cozy and snuggly as one of these bad boys, and owning a couple myself, I can say that they’re a favorite in my closet. If you don’t want a basic one, this one says HOLY CANNOLI, is hilarious, on sale. This one is an adorable Christmas sweater, and this one (also on sale for $55) pays homage to everyone’s favorite food: pizza. Perhaps this one is more appropriate for the pizza lover in your life? Or maybe a rose print is more suitable. Is your secret santa Naughty or Nice? I personally am gunning for the Rosé All Day variety. If you can’t tell, there are infinite versions and this could go on forever and ever and ever. So there you have it. The v feminine, active, mermaid-loving lady in your life would be beyond stoked to receive any of these items this Christmas/holiday season. If this wasn’t enough of a shopping list, try Chanel lipstick, a leather jacket, Steve Madden Stecy Sandals, anything from Madewell or Laura Mercier, a teeny bkr or a Nordstrom gift card.